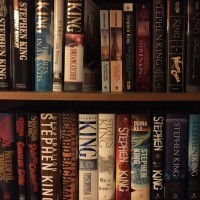 Books under Stephen King’s pseudonym Richard Bachman. Clayton Blaisdell, a.k.a. ‘Blaze’, is a huge man with a slow mind whose partner-in-crime has just died when the story begins, leaving him alone to carry out their final caper – the kidnapping of a baby. This simple story, engrossing but void of any significant surprises, is intertwined with what proves to be more or less Blaze’s entire life story. And a hard life it is, though not without moments of joy. It’s a simple but touching page-turner with both humour and some down-to-earth horror – mostly in the form of cold-hearted people – and perhaps just a touch of the supernatural. Along the way, a handful of ‘short cons’ performed by Blaze and the late George are presented. Though not making any secret of the actual author, King dusted off his old pseudonym when finally publishing the story, since it was written around the time of most the ‘original’ Richard Bachman stories. In his foreword King rightly notes that ‘Blaze’ has more than a touch of “Of Mice and Men” in it. Add to that the main character’s fondness for Charles Dickens’s “Oliver Twist” and, of course, King’s own style and unfiltered dialogue and you may get an idea of what’s in store. King also reveals that he, when finally revisiting and rewriting this decades old tale, changed his harsh opinion about it. And yes, it was worth publishing, and it’s worth reading. It is, above all, a fast read – the kind of book you pick up on vacation and put down finished a day or two later – it was in my case, at least. Published “posthumously”, (since Bachman died of cancer soon after his true identity was revealed) The Regulators tells “the other side of the story” in Desperation. Some characters are basically the same, others have switched names, the evil is the same but the setting is quite the opposite. One could argue that Desperation is the more serious of the two, but your perception of the books hinge a lot on which one you read first. The Regulators is, like Carrie, a blend of regular writing and fake newspaper articles, diary entries and letters, managing through the talent of King to read like story, rather than an experiment. Bachman’s most horrific (Kingish?) story. A gypsy curse sends Billy Halleck on a quest for the one person he thinks can remove it. Along the way some interesting questions are asked, but Thinner offers no easy answers and definitely no sigh of relief at the end. Dark, dark, dark, and then some. An interesting and perhaps somewhat disappointing fact is that King instead of genuine Romani chose to use incoherent sentences in Swedish for the gypsies lines. From what I’ve heard, these sentences where plucked from a Swedish translation of a King story. Written in a mindboggling 72 hours, this short novel is an entertaining thriller about a world where death is a natural part of tv entertainment. No intellectual challenge, but energetic, imaginative storytelling with a serious core. The most low-key of the Bachman books, a psychological drama about a man whose life suddenly falls apart, through the death of his only child and a highway construction that necessitates the destruction of his home. Bart Dawes responds by going quietly insane, in both dark and amusing ways. Well worth reading, but if you expect horror, or even action, you’ll put down the book disappointed. Two of the Bachman books describe competitions where the loser risks to lose his life. The Long Walk is very powerful work, telling the story of a hundred young men setting out on a marathon “promenade” – a competition held yearly by the government – which only one of them will finish. As in Rage, the interest lies not only in the dark and violent situation but in what people talk about along the way. As early as 1977, King began publishing novels under the pseudonym Richard Bachman, both as a way to get out stories that the publishers didn’t think was Kingesque enough to publish and to find out if he could “do it again”; start from scratch and work his way up. Although Bachman did get some attention – one critic said that Thinner was the sort of book King would have written if he’d only could – the books sold a lot better after the truth was revealed. In 1985 King chose to go public with his alter ego, before someone else could prove that he was Bachman. The Catcher in the Rye on acid, perhaps. A student flips out and holds his class prisoner at gunpoint. The situation quickly develops in a quite different way than to be expected, and under those weird circumstances some interesting truths come out, about the students and about other things. The first draft was written as early as 1967, and it is a “young” book in both good and perhaps not so good ways.